Royal Marine Light Infantry - H.M.S. Bulwark. 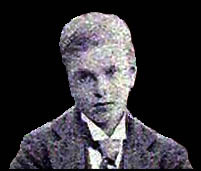 Son of Robert and Elizabeth Muggeridge. Robert and Elizabeth set up home at number 1, Sutton Lane, Banstead when they married, and Stephen and his siblings were all born there. Private Stephen Muggeridge was part of the crew on board HMS Bulwark, a battleship of 15,000 tons. 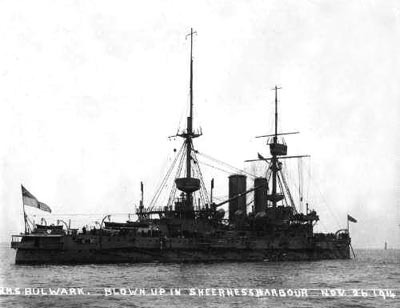 In late November 1914, it was one of the ships forming the 5th Battle Squadron and was moored to No.17 buoy in Kethole Reach on the River Medway, almost opposite the town of Sheerness, Isle of Sheppy, Kent. On the 26th November, at 07.30 the usual ship's routine was taking place when a roaring and rumbling sound was heard and a huge sheet of flame and debris shot upwards. The ship lifted out of the water and fell back. There was a thick cloud of grey smoke and further explosions. When the smoke eventually cleared, the Bulwark had sunk without trace. Only 14 men from the ship's complement of approximately 760 men survived that initial explosion. The ship had been moored on the Medway for some days, and many of her crew had been given leave the previous day. They had returned to the Bulwark at 7 o'clock that morning and the full complement was onboard at the time of the explosion. "I was at breakfast when I heard an explosion, and I went on deck. My first impression was that the report was produced by the firing of a salute by one of the ships, but the noise was quite exceptional. When I got on deck I soon saw that something awful had happened. The water and sky were obscured by dense volumes of smoke. We were at once ordered to the scene of the disaster to render what assistance we could. At first we could see nothing, but when the smoke cleared a bit we were horrified to find the battleship Bulwark had gone. She seemed to have entirely vanished from sight, but a little later we detected a portion of the huge vessel showing about 4ft above water. We kept a vigilant look-out for the unfortunate crew, but only saw two men." Boats of all kinds were launched from the nearby ships and shore to pick up survivors and the dead. Work was hampered by the amount of debris which included hammocks, furniture, boxes and hundreds of mutilated bodies. Fragments of personal items showered down in the streets of Sheerness. Initially 14 men survived the disaster, but some died later from their injuries. One of the survivors, an able seaman, had a miraculous escape. He said he was on the deck of the Bulwark when the explosion occurred. He was blown into the air, fell clear of the debris and managed to swim to wreckage and keep himself afloat until he was rescued. His injuries were slight. None of the Bulwark's officers survived; although 11 of them were recovered for eventual burial. At the inquest, the first witness was Lt. Benjamin George Carroll, who was assistant coaling officer at Sheerness. He stated that he was passing down the River Medway on the day in question and saw the Bulwark lying in Kethole Reach. He was looking at a signal she was flying, indicating the amount of coal onboard, when he saw a spurt of flame abaft the after barbette turret. Then the flame seemed to rush towards the after funnel and the whole interior of the ship blew into the air and everything seemed on fire. The deposition of Sgt. John Albert Budd, RM, who was still in hospital suffering from burns and a fractured leg, was read out to the court. In his deposition he said that he was serving on the Bulwark at the time of the explosion and had been with her since mobilization. At 7.30 he was finishing his breakfast on the portside second mess deck, when he saw a sudden flash aft. He turned and then the deck seemed to open up under him and he fell down. He recalled coming to the surface of the water and saw the Bulwark had disappeared. All the evidence pointed towards the explosion being internal. A juror asked "We should like to know how ignition occurred ?" The Coroner replied, "That is precisely what we cannot solve !" The Coroner, clearly not quite satisfied with the evidence, summed up the findings. He said it was impossible to discover exactly how the ignition was caused. The theory of external explosion could be discounted. If the jury were prepared to endorse the views placed before them, then their duty would be very simple. A verdict of accidental death was returned and the inquiry on the crew of HMS Bulwark was closed. During January 1915 many more bodies of the Bulwark's crew were washed up on the Kent shoreline. The body of Stephen Muggeridge may have been one of these but like so many others, it was never identified. Stephen was the first of the Banstead casualties and his name heads the list of casualties on the Memorial. 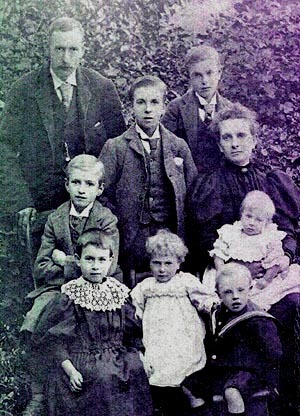 Stephen is shown in this family picture which was taken about 1895. He stands behind his mother, Elizabeth, and looks to be a shy, retiring young man of about 12. He was the second child of the marriage and stands next to Frederick his older brother. In front of his father, Robert, is George Muggeridge. Robert Muggeridge was captain of a local cricket club which had `The Victoria` as its H.Q. He was the wicket keeper. He worked as a gardener at the local asylum. George also played a great game of cricket...a very canny slow bowler; he once took the wicket of that other canny batsman, W G Grace. Grace refused to go back to the pavilion saying `They`ve come to see me bat, they can see you any day of the week! Peter Whiting, the son of the young curly haired little girl in the photo says "Stephen was killed long before I was born but his memory was kept alive in the family long after his death." PORTSMOUTH NAVAL MEMORIAL Hampshire, England. Article written by Richard Stacpoole-Ryding/Published by Medal News� September 1991. The full article including the statement by Winston Churchill can be found at HMS Bulwark - NHCRA (Naval Historical Collectors and Research Association.